Guidelines for cervical cancer screening have changed to allow HPV testing alone for women over 30. Pap smears have saved many lives since they became available decades ago. Inspecting samples of cervical tissue for precancerous changes is effective at catching possible cancer and is still the go-to test for women ages 21 to 29, according to the USPSTF guidelines. But there's another option. "Most cervical cancer is caused by what's called the human papillomavirus, or HPV," says Dr. Douglas Owens, a professor of medicine at Stanford University and vice chair of the USPSTF. "And we now have tests for HPV and that's an important step forward." These tests are available alone or in combination with the Pap test. And the USPSTF now says the evidence is strong enough that HPV tests can be used by themselves, for women over 30. That third choice expands on the task force's previous recommendation, which was for the Pap test or the combination test. And while Pap tests should be repeated every three years, women can wait five years between HPV tests. "Five years is a good balance between the benefits and harms," Owens says. "It's still highly effective at detecting cancer, and screening more frequently than that may increase some of the potential harms, so we think that's a good interval." Potential harms of too frequent screening include unnecessary follow-ups such as biopsies. In a draft recommendation released last year, the task force had considered suggesting just two options, either the Pap smear or the HPV test, but its final recommendation included the hybrid test too. "The HPV test alone is not available everywhere," Owens explains. "And so we want to be sure that women no matter where they're receiving care have options for cervical cancer screening." He says the combination test is widely available, as is the Pap test, "so all of those are good options and a woman can discuss with her physician what's available at the place where she's receiving care." Women may not notice the difference between tests because tissue samples are all collected the same way. But Debbie Saslow, senior director for HPV-related and women's cancers at the American Cancer Society, says if women have a choice, she would recommend the HPV test for women over 30. "I truly believe that including the HPV test, either along with the Pap or instead of the Pap, is superior than the Pap alone," she says. There's some evidence the HPV test is better than the Pap test at detecting a less common form of cervical cancer, adenocarcinoma, she says. "So wouldn't you rather find the two most common cancers instead of just the one most common type?" The task force emphasizes that all three tests are highly effective. The overarching recommendation is simply that women should get screened, and to do so regularly until the age of 65. If screening has been adequate up to that point, the task force says women do not need further cervical cancer screening. Health officials also recommend the HPV vaccine, which is given to girls and young women, up to age 26. (Boys and young men are encouraged to get the HPV vaccine as well.) But Owens says a vaccine alone doesn't replace cervical cancer screening. "Our recommendation applies to everyone whether you've been vaccinated or not," he says. "It's very important that women do not forgo screening because they've been vaccinated." 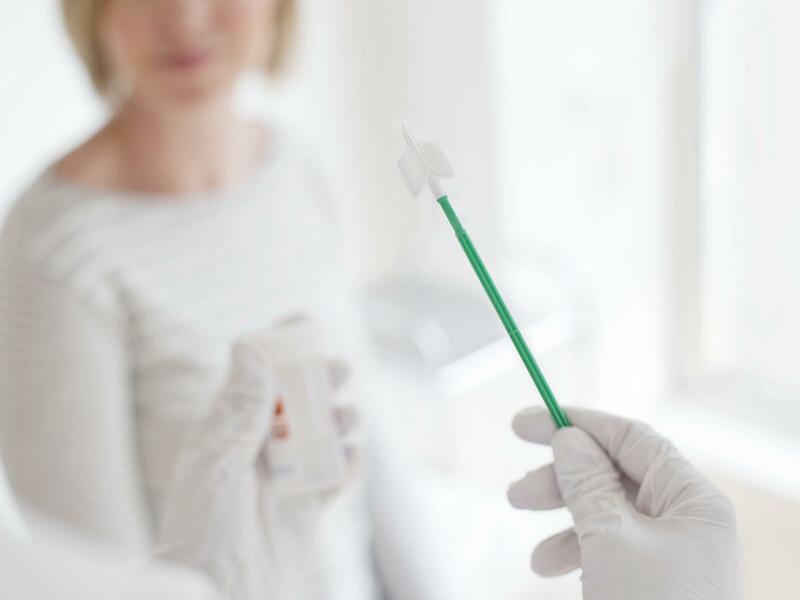 An effective vaccine could ultimately render cervical cancer screening unnecessary, but that change will require careful study and could be years away. A federal task force says many women can now consider three options when it's time for their cervical cancer screening tests. The influential group has expanded its recommendations for this potentially lifesaving exam. NPR's Richard Harris has more. RICHARD HARRIS, BYLINE: Pap smears have saved countless lives since they became available many decades ago. These samples of cervical tissue are still an effective way to find precancerous changes and still the go-to test for women age 21 to 29 according to the United States Preventive Services Task Force. Stanford medical professor Douglas Owens is the task force's vice chairman. DOUGLAS OWENS: Most of cervical cancer is caused by what's called human papillomavirus, or HPV. And we now have tests for HPV, and that's been an important step forward. HARRIS: These tests are either done alone or in combination with the Pap test. They are another good choice for women between the ages of 30 and 65, the task force now concludes. And Dr. Owens says while Pap tests should be repeated every three years, women can wait five years between HPV tests. OWENS: Five years is a good balance between the benefits and harms. It's still highly effective in detecting cancer, and that screening more frequently in that may increase some of the potential harms. And so we think that's a good interval. HARRIS: The harms, including unnecessary follow-ups, such as biopsies. The task force had considered suggesting two options, either the Pap smear or the HPV test, but its final recommendation, published in the medical journal JAMA included the combination test too, Owens says. OWENS: The HPV test alone is not available everywhere, and so we want to be sure that women, no matter where they're receiving care, have options for cervical cancer screening, and the combination Pap test plus HPV test is widely available. And so all of those are good options. And a woman can, you know, discuss with her clinician what's available at the place she's receiving care. HARRIS: Women may not notice the difference between test, says Debbie Saslow at the American Cancer Society. DEBBIE SASLOW: An HPV test, a Pap test - the sample is taken the exact same way. Women usually won't know which one they're getting unless they ask. HARRIS: And she says that's potentially a problem since the follow-up time is different for the two - three years for the Pap test and five years for the HPV test. SASLOW: The biggest problem for cervical cancer screening and for most cancer screening is remembering to come back. And so one of the most proven evidence-based interventions is to provide reminders. And unfortunately most health plans don't do that. HARRIS: Saslow also says if women have a choice, she'd recommend the HPV test for women over 30. SASLOW: I truly believe that including the HPV test either along with the Pap or instead of the Pap is superior than the Pap alone. It detects a type of cancer that the Pap test does not. And so wouldn't you rather find the two most common cancers than just the one most common type? HARRIS: There's evidence the HPV test is better at detecting adenocarncinomas, a less common form of cervical cancer. The main point is simply to get tested, Saslow says. Health officials recommend the HPV vaccine as well. But Owens says a vaccine alone doesn't replace cervical cancer screening. OWENS: Our recommendation applies to everyone, whether you've been vaccinated or not. And it's very important that women don't forego screening because they've been vaccinated. HARRIS: Maybe eventually women who have been vaccinated will no longer need to get cervical cancer screening, but scientists want to have more evidence in hand before making that call. Richard Harris, NPR News. Transcript provided by NPR, Copyright NPR.